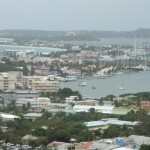 Where is Marigot’s Sweet Spot? I’ve searched throughout the Caribbean for a sweet something. Would I find it in Marigot? The vibrant little French town on the west coast of St. Martin has much to recommend it. Fort? Check. 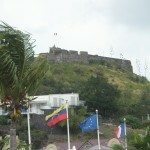 It has the requisite old fort on a hill. The 1767 Fort Louis shadows the town and once protected the harbor. Boat filled harbor? Check. Today that harbor is full of sailboats and catamarans, presumably owned by the idle rich. Chic shops? Check. 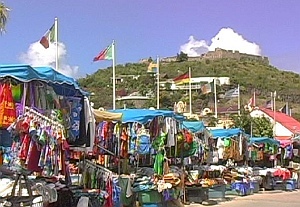 Shops with duty-free French goods draw tourists and cruisers alike. Open-air market? Check. 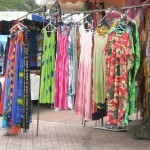 Brightly colored dresses, T-shirts, and other souvenirs beckon as they waft about in the breeze. But does Marigot have the Caribbean’s finest pain au chocolat? Basically a rectangular chocolate croissant, it should be gastronomic heaven. My noble, tireless, and relentless quest for the richest, flakiest, most delectable pain au chocolat drew me to Marigot. My quest drew me specifically to the scene of a pastry lover’s dream called Serafina’s. Located at Rue de L’anguille #14, on the waterfront, Serafina’s oozes sweet French pastries, as well as paninis and savory little croissant sandwiches. The smell of butter, yeast, and baguette drags you right up to the counter. Hoards of people eat breakfast and lunch at the under-roof outdoor tables, protected from rain and sun. Misters help cool diners in the heat of a summer day. A loving black and white cat hangs out and speaks, “Como ta’le vu?” (She is unschooled and speaks tourist gibberish.) It’s all very French. The glass pastry case holds beautiful treats, each a work of culinary genius. No ordinary cookies and cakes here. Each single pastry is a masterpiece. The tarts glisten with glaze over each perfect berry or apple slice. The Napoleons sport artistic frosting designs. Meringue clings in intricate folds. But alas, despite the visual artistry of the creations, this was not the Holy Grail of French baking that I sought. The pain au chocolat was serviceable. Chocolate tucked inside the folds of flaky pastry was dark and rich, but there wasn’t quite enough of it. The chocolate hadn’t melted barely enough to penetrate the first few layers of pastry, as it should. The pain au chocolat was not quite warm enough when served. The pastry was not quite as crisp, buttery, and delicious as others I’ve had from several street corner pastry shops on Martinique. It was certainly delicious and I would recommend a stop at Serafina’s to any visitor. 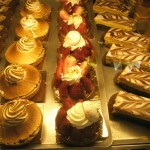 My standards are just very high in this quest for French pastry perfection and my search must, alas, continue. Have you discovered the perfect pain au chocolat in the Caribbean? If so, please let me know where your favorite can be found. If you want to launch your own search, contact me for help with that, too! Ah, a woman who knows the joy of a perfect pain au chocolat! We are soul sisters!! Everywhere I’ve travelled I’ve sought out my secret pleasure from Geneva, Switzerland (my initiation) to Spain.and France, Costa Rica and Argentina. 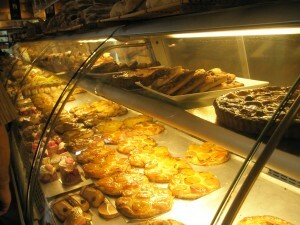 My personal faves were in a bakery in Montreal and, believe it or not, in Hong Kong! Thanks for rekindling the delicious memory!